Maria and Roksana met in Dr. Karen Beckman’s Film Theory seminar and bonded over their mutual fascination with sound politics and multimedia performance. 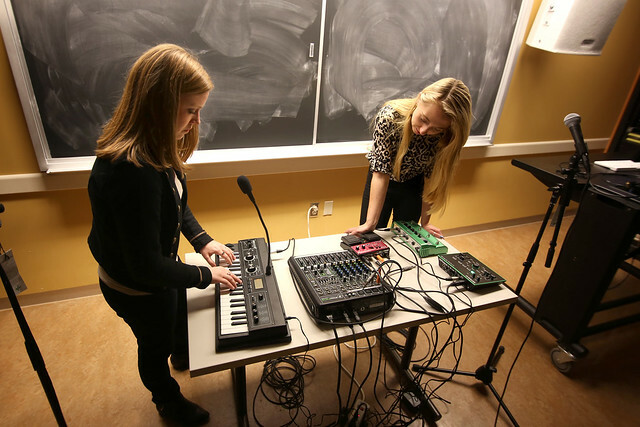 Recognizing the enormous interest in sound studies at the University of Pennsylvania, they spent a year brainstorming a workshop structure that would enable interdisciplinary collaboration, hands-on research, rigorous discussion, and open-ended play. Maria Murphy is a Musicology PhD candidate at the University of Pennsylvania. Her dissertation project considers the relationship between music technologies and body politics through the work of multimedia artists Laurie Anderson, Yoko Ono, and Karen Finley. Listening (to) Cyborgs allows Maria to share her hands-on research with a broader community of sound scholars and practitioners in the Philadelphia community. Currently, her research takes up the performances of Laurie Anderson, which sit at the junction of affects, media, processes, materials, and gestures, and often forcefully express the way these dimensions are instrumental to how we think about how bodies are formed, distributed, and through what modes of communication. Through exploration of the apparatuses of analogue versus digital knowledge and the state of the body under such epistemological regimes, Maria hopes to understand how the use of these technologies does not merely produce techniques of mediation, but instead exhibits a living process that fundamentally alters the protocols of communication. As a participant in Listening (to) Cyborgs, she is excited to interrogate the ways in which sound technologies can form and constitute our subjectivity as cyborgs. Roksana Filipowska is a History of Art PhD candidate at the University of Pennsylvania. Analyzing the aesthetics of the Anthropocene and the intersections between art and science, she is writing a dissertation on artists’ experiments in thermoplastics and their pursuit of plasticity as a model of citizenship during the years 1965 and 1975. Roksana has worked at the Institute of Contemporary Art in Philadelphia and the Albright-Knox Art Gallery in Buffalo, NY, co-curated the 2015 “Biocode: Performing Transgression after New Media” conference, and is a current Doan Fellow at the Chemical Heritage Foundation in Philadelphia. Her ongoing research interests include the process of abstraction, sound art, noise pollution and the use of sonic warfare in civilian life, and creating spaces for collaborative pedagogy.